Collaborate and Create With Post-it® Dry Erase Surfaces. Nice view? 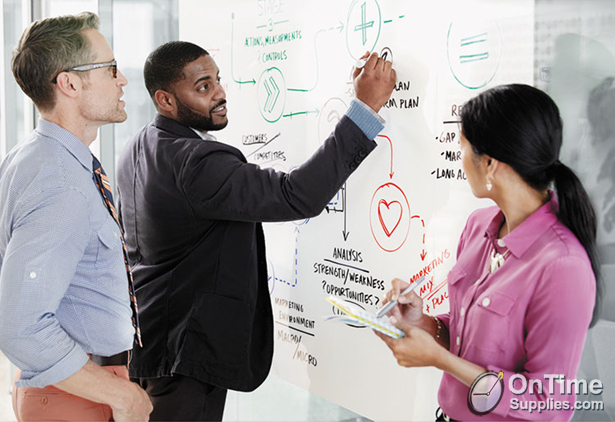 The Post-it® Dry Erase Surface lets you collaborate or teach from there. At On time Supplies we’ve been watching this product and have found the Post-it® Dry Erase Surface to be incredibly versatile in its ability to transform almost any space into a focal point of collaboration and creativity. Imagine that central desk or well-worn table in the office, re-purposed as a tool for communication. I’ve seen customers transform clip boards into writing surfaces that serve as the best tools for brainstorming sessions. Teachers can increase student engagement by converting desks or table tops into larger format work spaces for math, art, and writing practice. We’ve talked about cleaning dry erase boards before; but what we’ve found -with teachers especially- is that the “ghosting” and residue build up that occurs on most whiteboards eventually reaches a point of no return. If that ever happens to you, the Post-it® Dry Erase Surface is a great cost efficient option to revitalize those old whiteboards or even convert black boards. If you can come up with an application, the Post-it® Dry Erase Surface can probably get it done. How to apply your new Post-it® Dry Erase Surface. It’s as easy as unroll, peel, and stick…seriously. If you really want to get fancy, you can cut it to fit any shape or idea you’ve come up with. However, we suggest you get another person to help you if you’re applying it to a large area. The Post-it® Dry Erase Surface is essentially a huge sticker, and I don’t know about you, but every time I try to fix a sticker I just make it worse. The Post-it® Dry Erase Surface does well on most surfaces you can imagine: drywall, steel, finished wood, etc, and we’ve seen it perform especially well on glass. On the off chance that the adhesion doesn’t perform well on your target surface, 3M has been wonderful with customer engagement and stands by a “100% satisfaction” guarantee. Once you have your new Post-it® Dry Erase Surface is installed you’re in for a treat as it boasts a proprietary “stain-proof” surface. Essentially it’s designed to be an incredibly smooth writing experience that helps combat the “ghosting” you get over time with most white boards. So what are you waiting for? Start coming up with some everyday surfaces you can transform and let us know below. It’s time to set your creativity free!